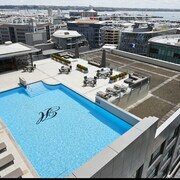 Room was well presented, great location to other options outside of the main Skycity complex. The staff were really friendly and helpful. My request for change of sheets was done quickly and efficiently. Great location & great luxurious comfort What an awesome modern room & comfortable bed. 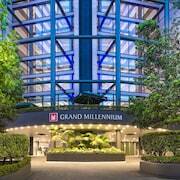 Such a great central location - so much to do within walking distance. Beautifully grand hotel and a great gym, pool & spa facility. Customer service was really good. Good options for food and drinks in the hotel. Great hotel for the right pricing. Why do I have to write more about my review, seems stupid doesn’t it? Staff were fantastic. Concierge very helpful and breakfast was top notch. Hotel was. Dry central to everything. Spend more time off with the fairies than actually working? Catch yourself flicking through old travel snaps over and over again? Time for a Helensville break. Hotel options in Helensville's centre are pretty thin on the ground. 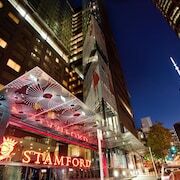 But if you're up for a short drive, you can comfortably stay in one of the 2 hotels within 10 kilometres of the action. A full-on day of travelling can really zap your energy. 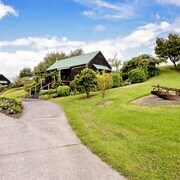 Hit the hay at Vineyard Cottages and Parakai Springs Lodge, some of the most central options in this area. You may also like to try the Bethells Beach Cottages, which you can find 25 kilometres away. Or perhaps the Ramada Suites Nautilus Orewa, just a distance of 25 kilometres from Helensville. Further alternatives are the Heritage Collection Waitakere Estate, 25 kilometres away, and the Quest Albany, 20 kilometres away. 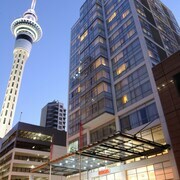 If you still have itchy feet, why not venture out and discover more of the Auckland Region region? The area features some gorgeous beaches and coastal plains. After staring slack-jawed at nature's masterpieces, take a look around famous tourist sights like old towns. Energetic travellers can also try their hand at popular regional activities like mountain climbing, hiking and zip-lining. Still haven't got your ideal room? You might just find a lavish enough thread count in Silverdale. You'll also be able to check out Matakatia Beach and Little Manly Beach. 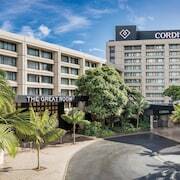 Silverdale accommodation options include the Orewa Beachside and Anchor Lodge Motel. Or, you could consider staying in Whangaparaoa, 30 kilometres to the east of Helensville, where you can choose from the Gulf Harbour Lodge and The Sheep and Shag B&B. Tiritiri Matangi and Shakespear Regional Park are popular places to explore for those visiting Whangaparaoa. Coromandel is home to some 2,000 people. It can be found 90 kilometres east of Helensville. Coromandel Goldfields Centre & Stamper Battery, Driving Creek Railway and the Coromandel Historical Museum are some of the local attractions that are worth looking into. There's a wide range accommodation options available in Coromandel. However, the Indigo Bush Studios, Coromandel TOP 10 Holiday Park and Harbour View Motel Coromandel ought to be the ones you look to first. More hotel options are the Driving Creek Villas, The Coromandel Treehouse, Coromandel Colonial Cottages Motel and Coromandel Court Motel. On the plane? Freaking out cos you haven't got a place to stay at the other end? Don't panic! Chances are you'll be able to crash at the Best Western BK's Pioneer Motor Lodge. It's pretty close to Auckland International Airport, which is 45 kilometres from Helensville's centre.